Without the fanfare and hoopla that surrounded the recent English National Ballet all-female triple bill, She Said, it is testament to Ballet BC and International Dance Festival Birmingham that female choreographers are not a scarcity in either the former nor the latter. With this being the only UK date, a premiere and the debate around non-male choreographers, I don’t understand why “the national critics” weren’t present, choosing to review NDT2 and Northern Ballet instead. As part of #TheBENCH, an event and wider choreographic support programme designed by 2Faced Dance Company to address the gender inequality in UK contemporary dance, Ballet BC’s Artistic Director Emily Molnar was invited to speak and offer an international perspective. With integrity, sense and articulate coherence in spades she responded and mentioned to the crowd that the company would be performing a programme of Crystal Pite, Sharon Eyal and Gai Behar as well as one of her own works. After seeing Eyal and Behar’s most recent commission on Scottish Dance Theatre earlier in the year and the fervour surrounding Crystal Pite’s forthcoming work on a series of national companies including Scottish Ballet, it was impossible not to be curious. Molnar’s work that premiered in 2013, 16+ a room, opened the evening. Riddled with detail, pace and luxurious unfurlings of time alongside a repeated slow and knowing presence of a stage walker who held a sign that read ‘This Is A Beginning’ or ‘This Is Not An End’, Molnar accentuated the visibility of time and allowed us to see all the full stops on stage. Almost imperceptible tremors in the bodies floated to the surface in the not quite stillness emphasising the control and fizz of the 16 company dancers. 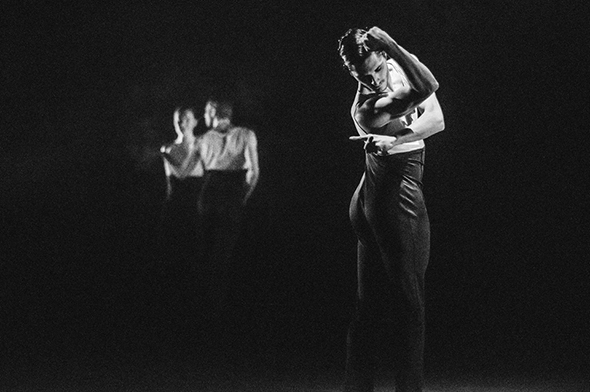 Building entrances and exits into the choreography nothing was wasted whilst oscillating between large packs of movement and intimate duets the piece became structurally familiar but no less impressive. With a lighting design like spots on a domino and an electric rasping soundtrack suiting the crispness of the taut choreographic vocabulary and Molnar’s staccato sock-sliding lunges and pulses 16+A Room was a satisfying start to proceedings. Pite’s Solo Echo left an emotional residue that I’ve only felt after watching the 1953 film Tokyo Story by Yasujirô Ozu. Both are a study of human connections, regret, present echoes and anticipation whilst leaving time for it to settle inside you. With an upstage set design of a constant drop of either snow, petals or sawdust and a sweeping piano and string soundtrack, I read Japanese cherry blossom in the spring, a time for renewal and rituals which were also present in the choreography. 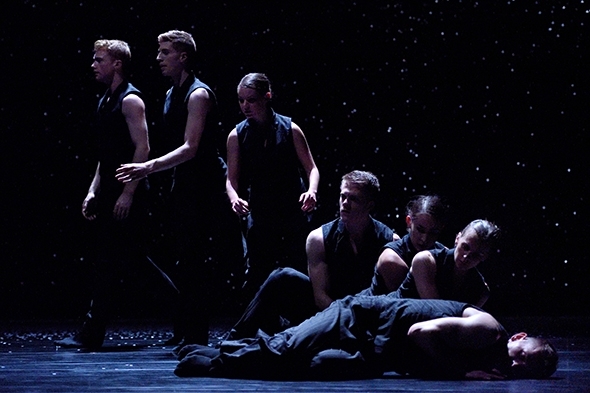 A recurring motif of the frozen run, giving space and a softness that supports others, showcased alternative qualities in seven dancers and their ability to connect with the audience and their material. Solo Echo has an emotional sting that remained inside the body long after the curtain had dropped. Bill is my second live encounter with an Eyal and Behar choreography. Here they remould bodies through anatomical adventures. We see the same limbs and torsos used by Molnar and Pite, yet the angles are skewed, bodies inverted and are presented with a fevered ballet and jelly-legged solos. The stage is flooded with choreography for 22 minutes; patterns of repetitive walking and clockwise rocking provide mesmeric satisfaction mixed with the occasional choreographic burst that is reminiscent of a 90s WWF move by The Bushwhackers beating their arms to a wide invisible drum. They enable the dancers to command the stage with a cat-walking focus whilst conveying the rapturous joy of movement. There’s a depth of field in play, real care for the scenography and texture of the world and a constant eye on the end; Eyal and Behar are always building, always layering and always in control of our gaze. There are echoes of Hofesh Shechter in as much as Eyal and Behar, like Shechter, have the ability to be 1% different, which sets them aside choreographically and spawns a band of imitators. Their craft is a pleasure to revel in. The construction of triple bills is a delicate game; wanting to build progressively but not drown and leave an audience with an emotional unevenness. Ballet BC’s triple bill was pitched well with an appetising opener, rich and complex main and a finale with all the trimmings and flourishes; here’s a company that has developed a repertoire of more than 35 works since 2009, from William Forsythe to Aszure Barton, and is actively collaborating with The National Ballet of Canada and Frankfurt Ballet to support artists, choreographers and audiences alike. Imagine if British companies would do the same.